Terrific news for cord cutters coming from the CES 2015 consumer electronics show today: Dish Network has just announced Sling TV, a brand new Internet-delivered TV package that offers live streaming and video-on-demand access to a selection of popular cable channels for just $20 per month. The core DISH Sling TV package includes 12 channels across a range of interests for kids and adults: ESPN, ESPN2, TNT, TBS, Food Network, HGTV, Travel Channel, Adult Swim, Cartoon Network, Disney Channel, ABC Family and CNN. You’ll be able to watch these channels live, and for certain channels, you’ll have access to a 3-Day video-on-demand replay feature. An optional "Kids Extra" package adds the Disney Junior, Disney CD, Boomerang, Baby TV and Duck TV channels and the "News & Info Extra" add-on offers HLN, Cooking Channel, DIY and Bloomberg TV. Both of these packages cost an extra $5. A third "Sports Extra" package is coming soon. In addition, you'll be able to watch Sling TV on the Google Nexus Player, select LG and Samsung Smart TVs, Roku and Xbox One. If your favorite streaming device isn’t listed above, don’t worry – support for other streaming boxes will be coming soon. 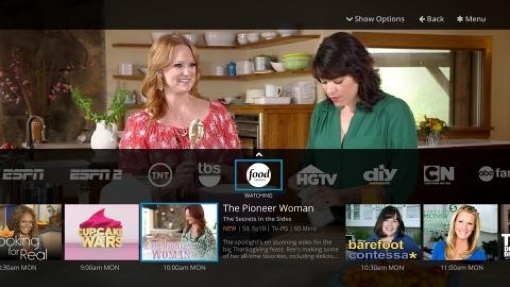 Sling TV is slated for launch sometime in the first quarter of 2015. To learn more about the coming service, visit the Sling TV website at sling.com.